+ 2 = seven Required Please enter the correct value. 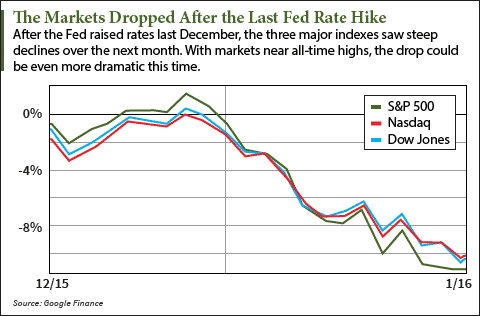 The December Fed rate hike was one of the biggest economic events of 2016, and it will affect everyone in 2017, from average investors to big banks. At the FOMC meeting on Dec. 15, the Fed announced interest rates will rise by 0.25% to a range of 0.5% to 0.75%. This is only the second time rates have changed since they dropped below 1% in 2008. While most investors focus on the fed funds rate, the Fed announcement will have a much broader impact than many people realize. Banks and financial institutions are governed by the Fed's interest rate. That means when the Fed raises rates, banks have to raise their rates, too. All loans – everything from mortgages to car loans – will see higher interest rates after the Fed announcement. That means borrowing will be more expensive across the board. Bloomberg reports homeowners were scrambling to refinance at historically low interest rates ahead of the Fed announcement. Interest rates are still below 1%, but rates are only headed higher from here. Higher interest rates also mean credit cards charge more interest. Credit card rates are variable, so these will move with the Fed's decisions. If you have a credit card balance, be aware your interest rate is going to tick up by 0.25%. However, a Fed rate hike has some benefits for consumers, too. Because savings accounts pay interest, the announcement at the FOMC meeting will mean savers will see more of a return. Again, the rate increase was only 0.25% this time, but these numbers will begin to add up if the Fed continues to hike up rates. The dollar also rallied in the wake of the Fed announcement. This is good for many Americans. Imported goods are cheaper when the dollar is stronger, and Americans travelling abroad will find the exchange rate more favorable. Even though a Fed rate hike was expected, in the hour after the announcement, the S&P 500 dropped 1%. 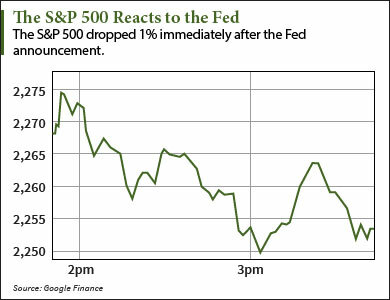 The chart to the right shows how the S&P 500 fell immediately after the Fed's announcement. First, the Fed has kept rates low to stimulate the economy. Higher interest rates are a sign the Fed no longer thinks the economy needs this stimulus. This means investors have to weigh the ability of the economy to grow without Fed stimulus. That adds uncertainty to the markets. Second, low interest rates have encouraged stock buying. Because low interest rates mean bonds pay very little in return, investors are forced into the stock market to find decent returns. As rates go up, so will yields on bonds. Investors looking for a safer option than stocks will have a viable alternative again. Low interest rates have also made borrowing money very cheap. This is partly why low interest rates stimulate the economy. But cheap borrowing has helped fuel the stock market, too. Corporations have used loans to purchase shares of their own stocks. This boosts their stock prices and rewards shareholders. Since the Fed slashed interest rates in 2008, corporations have taken out $1.91 trillion worth of debt while buying over $2 trillion worth of their own stocks. This level of stock buying has helped drive up stock prices. With interest rates rising, borrowing becomes more expensive. And corporations won't be able to buy back shares so easily. Prices could flatten with less money spent on stocks. Third, the stock market has been shattering record highs this month. The three major indexes hit their all-time highs last Tuesday (Dec. 12), just over a week after they all closed at their record highs on the same day (Dec. 1). Since the election, the Dow has exploded through the 19,000 level. The Dow is currently at 19,903.10 – less than 100 points from breaking through the 20,000 level. The markets have been smashing records due to optimism a Trump presidency will usher in an era of lower taxes and expanded infrastructure spending. Investors expect these policies will boost the economy. But with markets surging to these new heights, the possibility we are in a stock market bubble is weighing on investors. Higher interest rates could mean a pullback from record highs. A similar event happened last year. Interest rates were raised at the FOMC meeting in December 2015, the first rate hike since interest rates fell below 1% in 2008. The markets then saw a month-long decline during January 2016, as the chart below shows. With the markets surging to new highs this year, a new pullback could be drastic. That's why investors need to be prepared for a stock market crash in 2017. Takeaway 3: What Will the Fed Do Next?